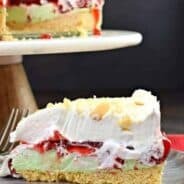 Looking for an easy Halloween treat? 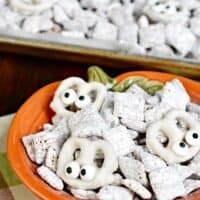 This Halloween Muddy Buddies recipe is the classic puppy chow recipe with some white chocolate pretzels made into mummies! It’s no secret here on the blog that I hate Halloween. And as the years have gone by, it’s gotten easier for me to admit. I’m not THAT mom. You know the one. The one who can make the most adorable Halloween costumes with her sewing machine (what’s that???). Although I also hate buying those stupid plastic costumes that make girls look like hookers (even if they just want to be a police officer or doctor). So I’ve had this happy medium for years….homemade costumes with old clothes to make scarecrows, witches, cats, puppies, mice, etc…..
I’m finally at a point where my kids don’t dress up…and when they do, they make their own costumes (can I get a hallelujah?? or an amen??)!! But, I do still like to put out a few fun treats for us to indulge on each year. In the past I’ve made Monster Sugar Cookies… Monster Fudge…Monster Cookie Dough CheeseBall…see a pattern? I’ve also made Mummy Snickerdoodle Bites and Mummy Cupcakes. I’m sort of obsessed with these candy eyeballs. So much so, that I had to go to three different stores last week to find a package of them! Looks like everyone else in my town is obsessed with them too (next time I’ll just order them on Amazon)! 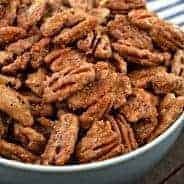 For the muddy buddies, melt chocolate chips, peanut butter, and butter in a large bowl in the microwave for 90 seconds, stirring every 30 seconds. In a very large bowl, add cereal. Pour melted chocolate mixture over cereal and mix gently until evenly coated. In a large gallon sized ziploc bag, add powdered sugar. Add chocolate covered cereal. Seal and shake until all the cereal is coated with powdered sugar. For the mummies, melt white chocolate and using a toothpick, add a dollop of white chocolate to each eyeball. Attach to a white chocolate Flipz pretzel. Allow to harden on parchment paper (about 15 minutes). 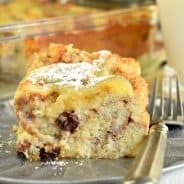 Serve with muddy buddies!! 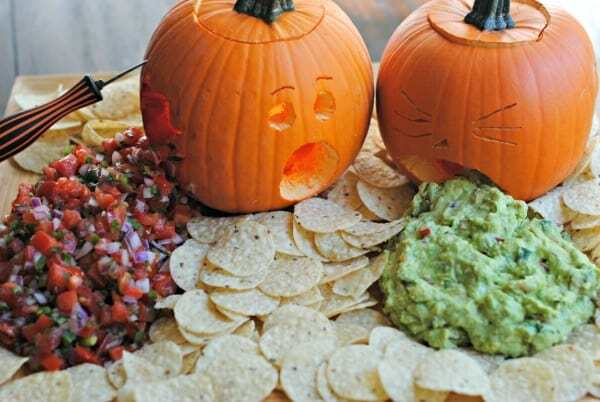 Homemade Pico de Gallo and Homemade Guacamole in this fun Pumpkin Carving snack idea!!! Rats and Bones for dinner? Too creepy? 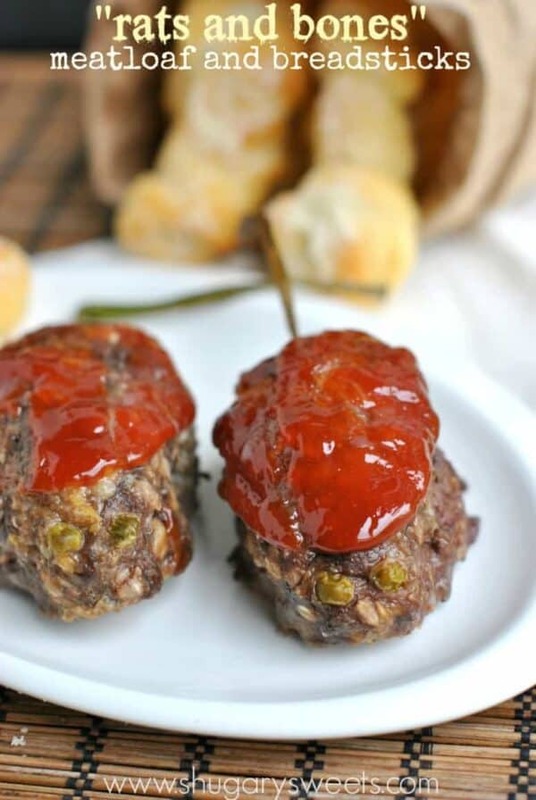 Delicious meatloaf and garlic breadsticks, haha!! This super sweet, Halloween Fudge Ring is a delicious treat for your next fall party! I love muddy buddies! These are adorable! Trick or treat!!! Definitely treat! These are so cute Aimee, and not too scary for the littles. I’m indifferent about Halloween and my husband could care less about it. The most exciting part for us is the leftover candy. 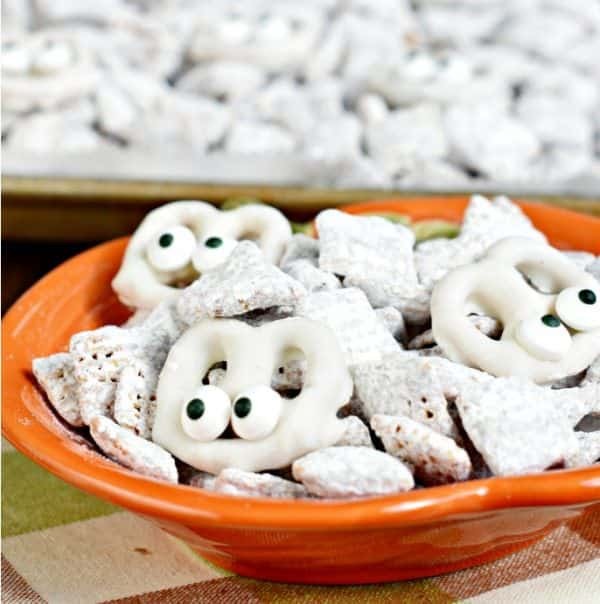 These Halloween muddy buddies will be perfect for us to eat while we hand out the candy! You know how I feel about those adorbs googly eyes! Love this fun treat! Now I’m totally craving muddy buddies first thing in the morning. It is cereal after all, right? Wink, wink! 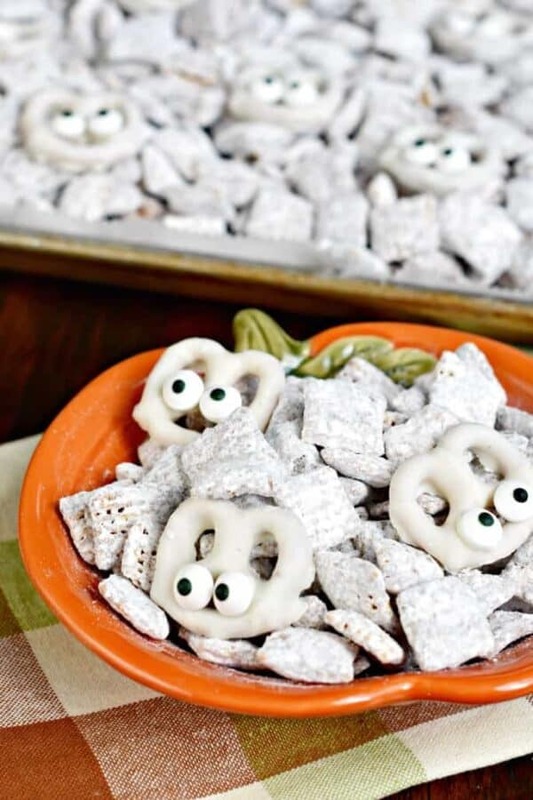 What a fun muddy buddies mix! I’m with Danae, I think I need to make a batch for me and my husband to eat while we pass out candy! Ok, I am glad I am not the only one who hates Halloween and yes those costumes are HORRIBLE!!! 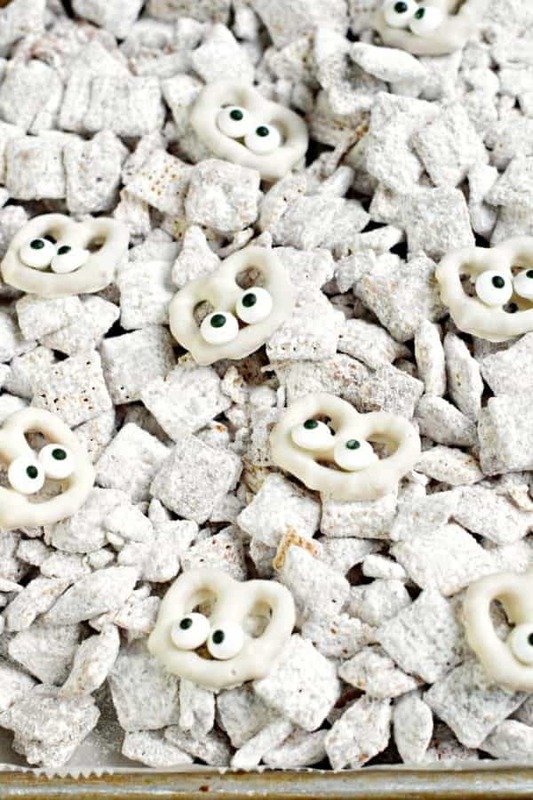 When I think of muddy buddies it instantly takes me back as they have always been one of my favorites! And those googly eyes are totally adorable!! This is so cute and fun! I wish I was a creative Mom that could sew costumes but I don’t even try to act like I am anymore! Very cute! Perfect for a Halloween party! These are so stinkin cute!!! Love it, and yes I have learned just order it on amazon so much easier for most things!! What a great treat. Thanks Aimee! My youngest was born on Halloween – best treat I’ve ever had, but tricked me into being “one of those moms”. Until she was about seven, she was sure everyone dressed up just for her day 🙂 Every year we have a huge bash and this treat will help take the pressure off of “what am gonna make this year?”. You’re life saver! Think I will tint some of the powdered sugar with orange & yellow and add some pumpkin pie spice and layer them in clear plastic cups to mimic candy corn. 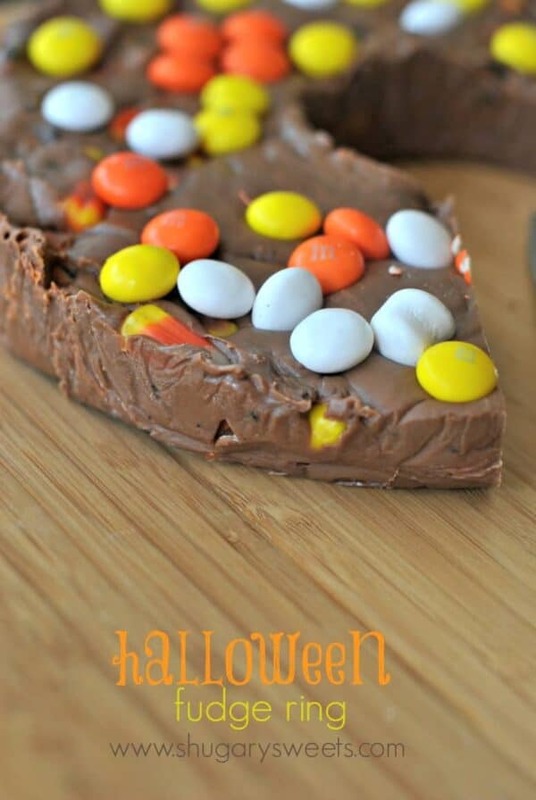 This is such a fun Halloween recipe!